Bella Aquila offers a brunch every Sunday and in addition to regular menu items there well be specials for Mother's day. 9:30 a.m. to 2:30 p.m. Bella Aquila also has an awesome outdoor patio that sits along the Boise River, so weather permitting you and mom can enjoy a great outdoor view. Reservations are required and when I checked, they were almost fully booked, but there may still be a few reservations available. 208-938-1900. Chandlers is opening early (1pm) and is supplementing its regular menu with a three-course Mother’s Day meal for ($43 per person) Reservations for 1-8 p.m. are being accepted with a portion of the proceeds from the meal to benefit the Women's and Children's Alliance! Start the meal with your choice of Lobster Bisque Soup, Soup, Mixed Green or Wedge Salad, then pick one of six amazing entrees and your choice of. Reservations are suggested and they are filling fast. 208-383-4300. In addition to the regular menu both Lucky Fins Seafood Grill locations will be offering Mother's day special menu items. Enjoy Fresh Alaskan Halibut, over red quinoa, roasted corn salsa, shaved red onion, grape tomatoes and fresh avocado with a cilantro lime drizzle. Or choose the Scallop and Ahi..Butter seared jumbo scallop with coffee and ancho crusted center cut Ahi tuna with cauliflower puree, grape tomatoes, roasted cauliflower, fresh basil and a drizzle of chili oil. No reservations are required, but you might have a little wait during busy times of the day. Both Bardenay locations in downtown Boise and Eagle, will have brunch buffets ($29.95 adults, $14.95 children 4-12, 3 and younger free) from 10 a.m.-2 p.m. That price includes either a mimosa, a glass of OJ, coffee or a soda. The buffet features a prime-rib carving station, omelet bar, shrimp cocktail, waffles, specialty cheeses and desserts, thick-cut bacon, chicken wings, salmon, assorted potatoes, asparagus and hollandaise, eggs, biscuits and gravy, ham and sausage and fresh fruit. No reservations are taken, but they say your wait won't be long. Boise number: 208-426-0538; Eagle number: 208-938-5093. 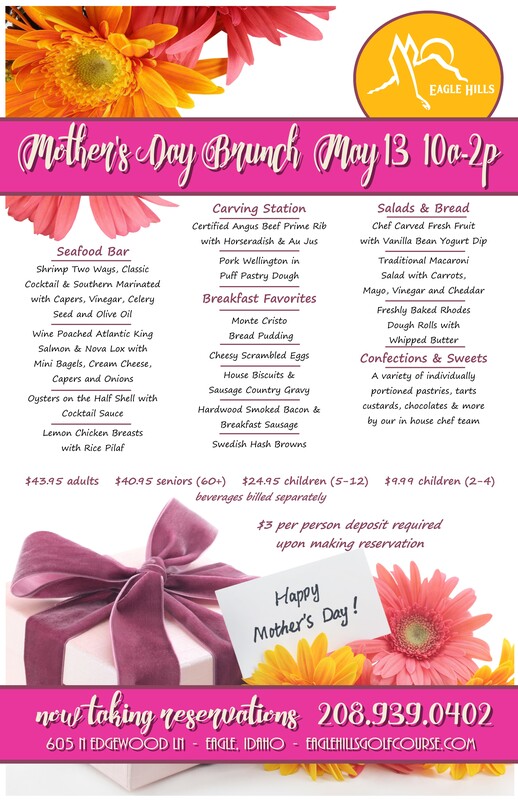 Saint Lawrence Gridiron offers a special Mother’s Day menu in addition to a version of its regular brunch menu, from 9:30 a.m.-2 p.m. Moms will each receive a flower and chocolate. Twigs located at the Village in Meridian, will feature a special Mother's Day brunch, where for $28.99 you can feast on slow-roasted prime rib, ham, salmon and all the fixings plus a chocolate fountain and mimosas! Reservations are recommended. Chateau Eagle I 176 South Rosebud, Eagle. Interested in a three course luxury meal? Treat you mom to some fine dining at Chateau Eagle. Cost: $49 for adults, $29 for Children 10 to 6 and Children under 6 are $19. Make your reservations by calling 208-947-2840. Check out the menu here. Hell's Canyon Winery I 18835 Symms Road, Caldwell. There are so many different places in the Treasure Valley just waiting to help make Mother’s Day special for you and your family, hopefully these will give you a few ideas, just keep in mind Mother's day is one of the most busy days of the year for restaurants, because who wants to make mom cook dinner on her day, so be patient you my have a short wait at most restaurants who are featuring special Mother's day menus.